Step 1: Construct the triangle KLM. Step 2: Bosect the lines KL and LM and extend the bisector lines to meet at point O. 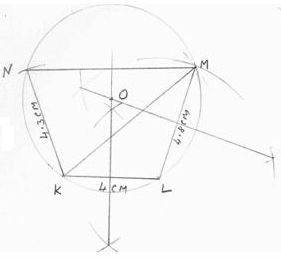 Step 3: With O as origin, draw a circle passing through the points K, L and M.
Step 4: From K, draw an arc of radius 4.3 cm to cut the circle at point N.
Step 5: Draw the quadrilateral KLMN. Q 5: Construct a cyclic quadrilateral XYZT with XY= 6.5cm, YZ=7.5cm, ZT=8cm and XTZ = 120 degrees.